Dengue Dengue Dengue! is a Tropical Bass duo from Lima-Peru. Behind the masks are Felipe Salmon and Rafael Pereira, two producers, dj's and graphic designers/vj's. DDD was born in mid-2010 and inmediatly made themselves well known thanks to an impeccable audiovisual show, remixing and making mash-ups from their own tracks with old cumbias and modifying cumbia cult themes to electronic versions. All this always joined by amazing visuals and the always present masks. In early 2011 they began to publish their first productions, being bloggued in major and specialized music portals in USA, Europe and the UK. 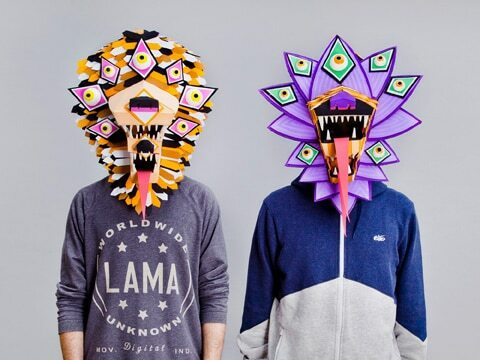 Their sound started to spread faster, playing in major events and festivals in Peru. Along with the "Auxiliar" Collective, the start producing the TOMA! Sessions, helping to consolidate the growing and vibrant Tropical Bass movement in Lima, inviting musicians and DJs from different places to share sounds and ideas. In October 2012 they released their debut album “La Alianza Profana” (or "The Unholy Alliance") and the video for the single “Simiolo” . The Album and video, both published by the Peruvian label Auxiliar, are an instant success with both the press and fans, locally and internationally . The album caught the attention of Berlin´s Chusma Records, who later (2013), re-released the Album for Europe, Asia and Australia. They start traveling and playing important shows like the NOVA Art Festival in Sao Paulo, Brazil and the III Iberoamerican Design Bienal in Madrid, Spain. 2013 is the year where things really took off : it started with a great Mexican tour and, in June, an amazing two month European Tour, playing at major festivals and clubs all around Europe in cities like Berlin, Vienna, Prague, Madrid , Barcelona, Paris, Stockholm among others. In July Chusma Records released the Simiolo Remixes EP, and Enchufada Records the track Lockumba for the “Upper Cuts” series, showcasing yet another side of the Dengue Dengue Dengue! sound. By 2014 the sound of DDD had matured into a wider spectrum of sounds, bringing elements not only from Peru, but also studying and researching other cultures and their native sounds, traveling around Europe, Asia and the Americas playing shows, collecting sounds and ideas. The duo released the EP “Serpiente Dorada” on Buraka Son Sistema´s label Enchufada Records, with 6 new tracks that take their music to a new level. They toured around the world during 3 European Tours (42 Shows) and also performed in Cuba, Japan, Argentina, Chile, China, Brazil, Colombia, etc. playing in the most renowned festivals like Roskilde, Dour, Paleo and an amazing show at the SONAR Festival Dome which was reviewed by Xlr8r as one of the best shows in the festival. They also had the honour of being invited by the Red Bull Music Academy to give a lecture in Tokyo on their academy sessions. 2016 is already full of projects and surprises, with the release of DDD´s second Album in May that will come with a new video and live show. They have 3 major tours planned for this year: a full Latin American tour from January to March, a European tour from May to August and a US and Canada Tour in September.